This collaboration project is the winner of the Creative Heroes Award 2017 within the category Interieur – Samenwerking together with Theaters Tilburg, TextielMuseum / TextielLab and University of Tokyo. The Theaters Tilburg commissioned textile architect Samira Boon to re-design the complete interior of the Audax room. This space is daily used for different kind of events e.g. small gatherings or public meetings. The briefing for the Audax room was therefor to create a dynamic flexible environment, a so-called ‘open infrastructure’ as well as an eye-catcher representing the cultural programme of this theatre. “You can constantly give this object a different look, I always get the feeling as if I’m walking through a visual art work, while at the same time it is a very functional space.” says Rob van Steen, director Theaters Tilburg. 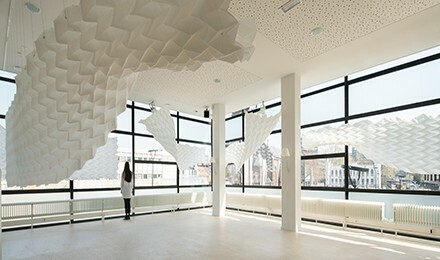 After the promising results of the 3d woven SUPER FOLDS and the architectural ARCHI FOLDS the next step was to integrate these ARCHI FOLDS customized to this space. Buildings are generally created to be permanent. The ARCHIFOLDS are created to be transformable objects by its in- and unfolding qualities. The reason Studio Samira Boon continues her quest to explore the possibilities of these folding structures. The woven origami textiles have been developed in close collaboration with Tokyo University, mr. Prof. T. Tachi (professor in origami science), the R&D department of the Textile Museum (TextileLab). The project in the Theaters Tilburg shows the ARCHI FOLDS are a next step in a more flexible architecture. The development in computerized textile materialisation of origami structures is unique and carries enormous potential. The ARCHI FOLDS can have different dimensions and weights and is an important moving and adaptable element to reduce or maximize capacity in a room. Studio Samira Boon works mainly with textile materials; textiles both for domestic and business settings to create a pleasant atmosphere. The ARCHI FOLDS e.g. create ‘open’ or more ‘closed intimate’ spaces, and supports the acoustics. The used materials are fire retardant and resistant to UV. The advanced textiles are the result of a very technical and innovative engineering process: the research on yarns, the bindings, the software that had to be developed to create the folding structure with the computer in combination with the technical possibilities of the weaving machines.